Cricket - Elland v Clayton West. Elland bowler Alec Hodgson. Elland have climbed to third in a tightly-packed Huddersfield League Championship table after a nervy three-wicket win away to Holmfirth yesterday. The Hullen Edge men bowled out their hosts for 86, with Alec Hodgson and Peter Dobson taking three wickets each, but lost seven wickets in reaching their target. Sami Ur-Rehman top scored with 34 for Holmfirth and No 11 Bilal Hamad hit 21 not out at the end. Hodgson led the Elland response with 30 and Liam Fletcher made 17 as the visitors gained compensation for an abandonment on Saturday, when they were 78-3 in reply to Clayton West’s 122. Barkisland lost to Lascelles Hall in the other Championship match to survive the rain yesterday but they retain top spot. In a 20-over match, Hall made 124-6 and Barkisland capitulated to 95 all out following the run out of top scorer Luke Bridges (25), the third man out with the total on 55. Barkisland and Slaithwaite had tied on Saturday, both sides finishing on 218-8. The Calderdale side batted first and Bridges’ 85 helped them recover from 31-3. Slaithwaite lost their way after a 51-run opening stand but Harrison Quarmby got them back in the hunt with 71 not out and there were two run outs in a frantic finale. 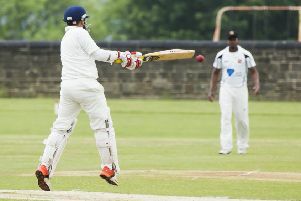 Rastrick were unable to push their promotion hopes over the weekend. They collected one point against Holmfirth on Saturday when they fell short of a reduced target, making 205-8 off 47 overs in reply to their opponents’ 249-7 off 50. The Round Hill men’s game at Almondbury yesterday was washed out. Points (after 15): Barkisland 63, Almondbury Wesleyans 62, Elland 58, Clayton West 55, Rastrick 55, Holmfirth 54, Skelmanthorpe 53, Slaithwaite 53, Lascelles Hall 50, Meltham 28, Almondbury 20, Lepton Highlanders 20.